There was a time in the early days of Android when HTC was heralded as a force to compete against Apple's iPhones. 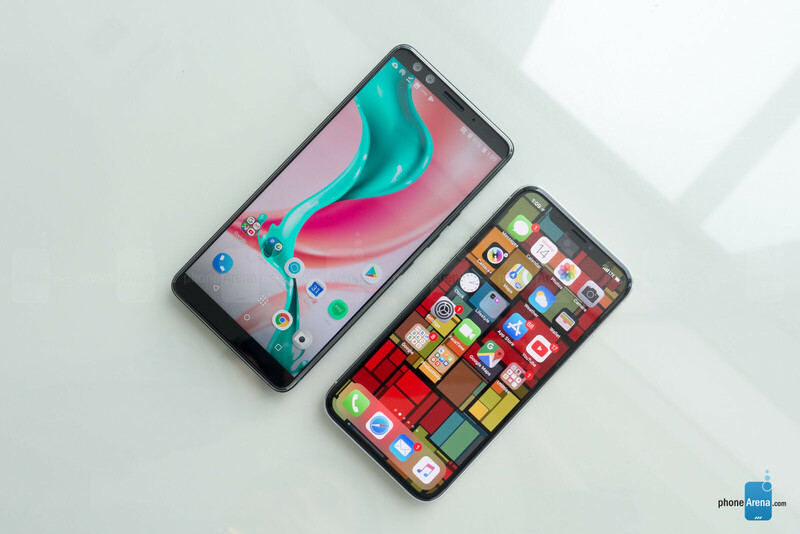 The Taiwanese company was undeniably thought of in high regard by many, but that hasn't been the case in a long while now, especially when its smartphones have failed to generate any considerable buzz. 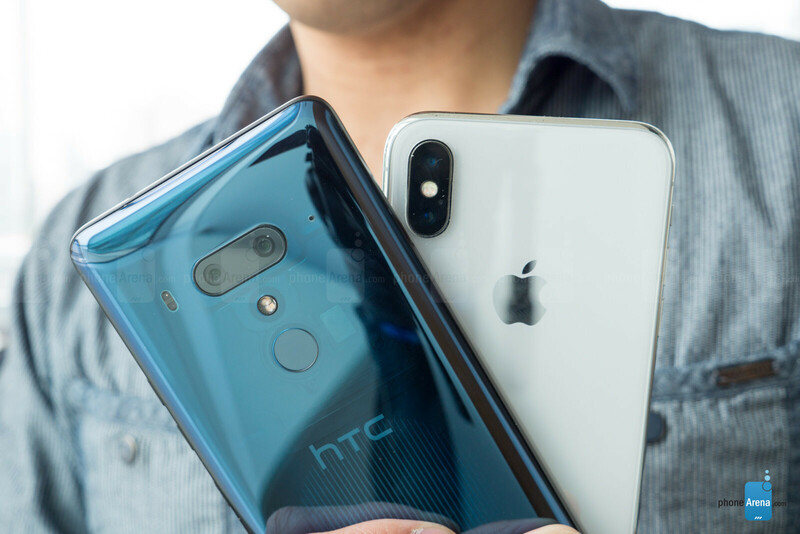 Hopefully, that's all about to change, as the HTC U12+ is out to redeem itself as a formidable flagship smartphone that can stand toe-to-toe against Apple's best, the iPhone X. These two handsets are very different-looking from one another. The iPhone X's design is unmistakable from a far glance, but more importantly, its stainless-steel frame gives it a more substantial, higher-quality feel. On top of that, it features a smaller footprint that makes it easier to handle using one hand – whereas the HTC U12+ is a handful to operate. Even though the iPhone X's design is unmistakable, we will certainly say that HTC has something just as compelling with its offering. Paint jobs don't necessarily carry a phone's design as much as other things, but in the case of the HTC U12+, two particular paint jobs make it stand out. 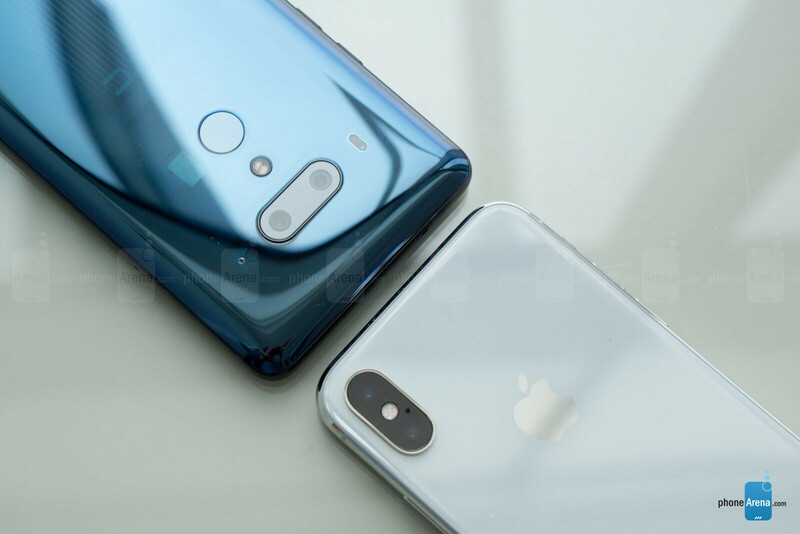 The translucent blue and flame red color variants of the HTC U12+ are without question attractive to the eyes, conjuring up something we don't see in the iPhone X's two color options. Neither handset offers a headphone jack, but it should be noted that the HTC U12+ features a slightly more water-resistant IP68 rating – versus the IP67 certification of the iPhone X. Having used the iPhone X for a while, we're well aware of its powerful set of speakers, so we're eager to hear how the HTC U12+'s pair of HTC BoomSound speakers compare! Over in the specs department, the HTC U12+ features a 6-inch QHD+ (1440 x 2880) Super LCD 6 display, while the iPhone X presents us with a 5.8-inch Super Retina OLED Display (1125 x 2436). Without question, there's plenty of detail delivered by the two panels – so there's not a single one that's vastly more detailed from a normal viewing distance. 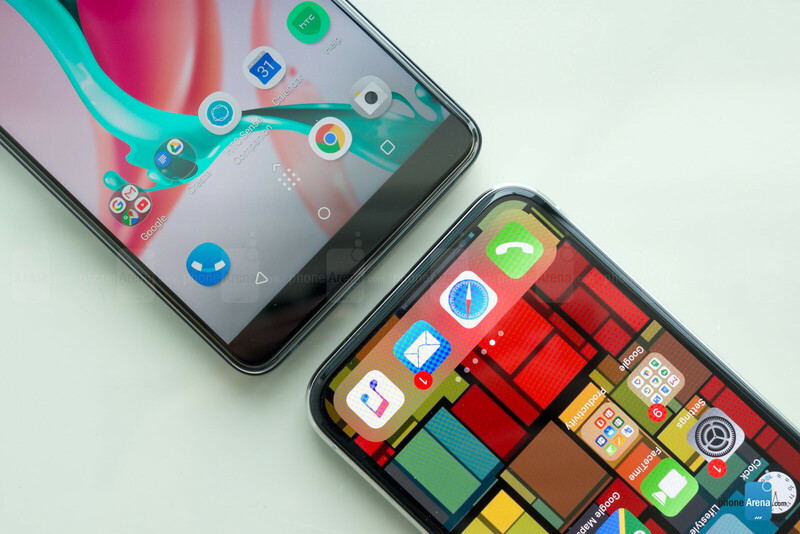 While the two displays radiate nicely when viewed straight on, the HTC U12+'s display exhibits noticeable distortion when it's viewed from different angles. Obviously, it's not a distraction if you're just the only one looking at it, but for those around you trying to view the screen, it can be a distraction then. Then again, the notch on the iPhone X's display can be regarded as an equal distraction of sorts, since it breaks up the uniformity of the display. To its credit, though, the notch is there to accommodate the superior face tracking technology with the iPhone X. As for the HTC U12+, there's no notch whatsoever, which is something we're happy to see! Now, it should be worth pointing out that the HTC U12+'s display is uniform in order to accommodate the dual front-facing cameras it's packing. 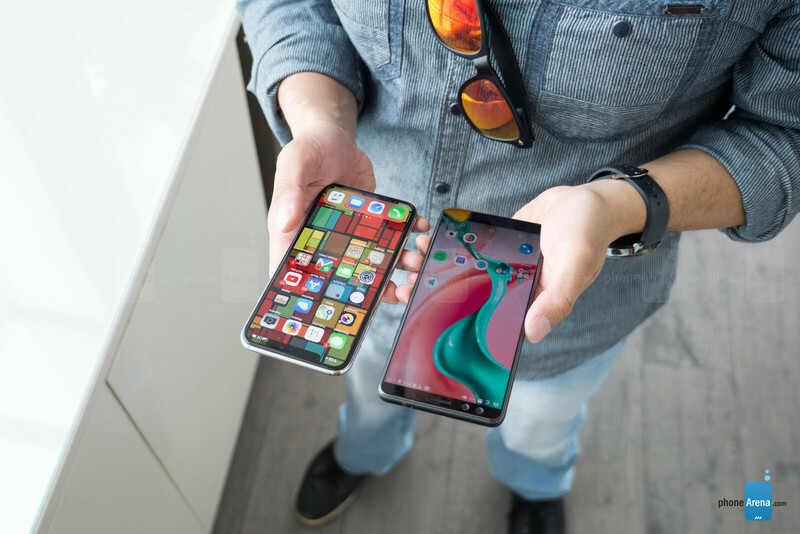 The age-old comparison between Android and iOS also exists here, where both experiences accomplish the same basic functions of what we expect to get out of today's smartphones. HTC does implement some novel ideas to its experience, like its Edge Sense features where "squeezing" the phone performs different functions – or the new double tap feature. The iPhone X emphasizes heavily on a gesture-based user experience, which initially takes some time to get acquainted with. But for the most part, it follows a very straightforward, no-hassle experience. When it comes to processing power, it appears as though the two are equipped to handle even the most intensive stuff. For the iPhone X, it's powered by the A11 Bionic chipset, which as we all know, runs flawlessly for all applications. From what we're able to see so far with the HTC U12+, much like its contemporaries in the Android space, it is powered by the latest generation Qualcomm Snapdragon 845 SoC, which commands a great amount of responsiveness from what we can see so far out of the phone. And while the iPhone X is a proven champion when it comes to gaming, we're confident the HTC U12+ will handle gaming as good as its rival. Then again, we do appreciate that the HTC U12+ is accompanied with a microSD card slot, which helps to supplement its base 64GB internal storage – whereas with the iPhone X, you're stuck with either 64GB or 256GB capacities with no expansion! HTC is finally in the dual-camera realm with its latest flagship, as its pair breaks down to a 12MP wide-angle f/1.76 UltraPixel sensor and a 16MP 2x optical zoom one with an f/2.6 aperture. In contrast, the iPhone X features a pair of 12MP cameras with OIS, with the two of them breaking down to a wide-angle f/1.8 lens and a telephoto f/2.4 one. Naturally, you'll be able to achieve those sweet-looking portrait shots that have become a signature feature with most dual-camera implementations. 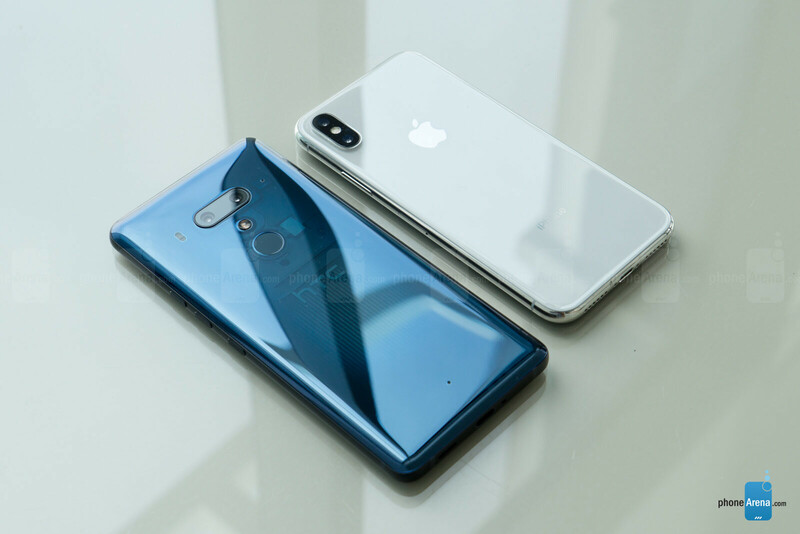 However, the benefit here with these two phones is that they offer additional range that other cameras lack with their secondary telephoto cameras. It's really tough to gauge right now which of the two seems to be better than the other, but those who prefer a bit more control with how their compositions will turn out may want to stick with the HTC U12+ because it's accompanied by a deeper set of modes and manual controls. Most would think that the HTC U12+ might produce better selfies with its dual front-facing 8MP cameras, but as we know the iPhone X's single 7MP one is capable of producing some stunning results on its own! Over on the video side, we'll again mention how the HTC U12+ seems to offer more features that enthusiast will appreciate – like the new Sonic Zoom function, which relates to its video capturing abilities. In particular, when using the zoom while recording, the microphones on the HTC U12+ will perform an "audio zoom" of sorts to hone its capture on your subject. Meanwhile, the iPhone X's video recording experience is pretty much isolated to just an automatic mode and slow-motion, which the HTC U12+ also offers. Usually, when there's a huge disparity between battery capacities, most people would be led to believe that the higher-capacity one would prove to deliver longer results, but that's not necessarily the case. The HTC U12+ packs on a 3500 mAh battery cell, which is significantly higher than the iPhone X's 2716 mAh capacity, but we'll have to pass judgment once we're able to put the HTC U12+ through our usual array of battery tests. It's worth mentioning, though, that the HTC U12+ lacks wireless charging, which is a convenience that's available with the iPhone X.
HTC has been in trying for a while to reestablish itself as a premier player in the smartphone landscape, one that's been dominated by Apple and its smartphones. As we know, the iPhone X is the most advanced iPhone to date, but it carries one of the heftiest cost out there commanding a starting price point of $1000. HTC intends on capitalizing on that, just because when the U12+ launches here in the US, it'll start at a more moderate price point of $799 with the translucent blue option. The $200 difference between the two phones might not seem like it's a lot, so it'll be interesting to see how consumers perceive HTC's flagship at that price point. It's certainly competitive, especially with the savings you'd get in the process, but we're crossing our fingers that the HTC U12+ can perform strongly in all the same areas we see with the iPhone X already! HTC actually is reintroducing dual cameras as we know the M8 had dual cameras. Also the Sonic Zoom was introduced on the U11 and it is quite a unique feature. HTC needs a whole new design, phone look too 2010ish. They did in htc U11,U11+ with 18:9 display,U ultra with double screen,now 12+ with more screen estate but u just love to pay disrespect to ur old favourite smartphones brand.Try one of these then talk about ur 2010 experience with htc evo 3D.If didn't like it it after trying for a time then i respect ur opinion. After the battery in my HTC 10 degraded in very short order after about 12 months of use, I'm hesitant to pick up this phone. Fortunately HTC helped me in this decision by making the phone 12" tall, and 2" wide. No interest in owning one of these candy bars.